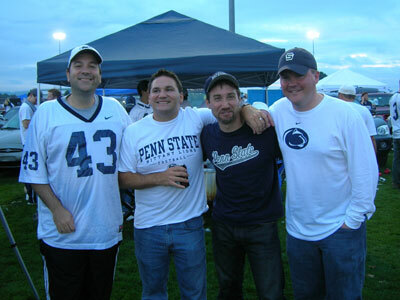 Much like last year, I joined some of my old college buddies to catch a Penn State football game at our alma mater. I finished the trip to State College on Friday afternoon, and met up with Steve, his wife Crystal, Brian, and Brian’s dad at our hotel, the local Super 8. During our two-hour (yet completely worthwhile) wait for dinner downtown, I bought a white sweatshirt and long-sleeved T-shirt in preparation for the “white-out” at the following night’s game, then enjoyed a few beers at one of our favorite bars, the Rathskeller. When we finally sat down at the Tavern, we thoroughly enjoyed a predictably wonderful meal (their prime rib is simply the best on earth). After dinner, the rest of the gang, which now included Marc and his wife Sarah, headed back to the hotel, while I went back to the ’Skeller for a few beers with some other friends who were also in State College for the weekend. The forecasted rain mercifully held off for most of the day, and some of our friends and relatives stopped by to visit throughout the afternoon. For some added entertainment, a rowdy, mostly college-age group next to us partied all day in the presence of two of their parents, who seemed completely unfazed by the drunken display. Penn State’s opponents, the 22nd-ranked Fighting Illini from Illinois, certainly came to play, jumping out to 7–0 and 14–7 leads in the first quarter alone. But unlike many frustrating games over the last few years, the 12th-ranked Nittany Lions answered the challenge with an explosive offense. In particular, Derrick Williams became the first PSU player under Joe Paterno’s long tenure to score a rushing, receiving, and kickoff-return touchdown in a single game. In the end, the Lions outgunned the talented Illini, 38–24, to win their conference opener and improve to a 5–0 record for the first time in three years. After the game, I broke from the group to join my parents, sisters, and two of my parents’ friends for post-game drinks at Whiskers, a comfortable, upscale bar at the Nittany Lion Inn on the west end of campus. The following morning, our group met up for breakfast at Perkins, then I made the return trip home through intermittent rain and relatively heavy traffic. Great weekend in Happy Valley, as always! I’m trying not to dwell on the seemingly infinite amount of bad news about the ongoing financial crisis. Really, I’m trying my best. * Update: On Sept. 29, 2008, the House of Representatives gave new meaning to government inertia by rejecting an admittedly imperfect yet important $700 billion bailout plan by a vote of 205 for, 228 against. In response to that news, the stock market embarked on a selling rampage. The Dow Jones Industrial Average plunged 777.68 points, its largest single-day point drop ever (but far from the biggest percentage-based decline). Meanwhile, the S&P 500 index lost an amazing 8.79%, more than double the daily declines of 4% that I had mentioned just last week. Regardless of the stock market’s penchant for insane mood swings, we still know one thing for sure. Faced with the biggest financial crisis since the Great Depression, our elected officials continue to argue, bicker, and — once again — do nothing. Congress has never been a bigger disgrace than they are right now, and that’s quite a statement to make. Let’s review the recent carnage in the financial world, shall we? As if the stunning collapse of Bear Stearns and its subsequent sale to JPMorgan Chase wasn’t enough, many more firms have also failed in the last two weeks: Fannie Mae and Freddie Mac (taken over by the government), Lehman Brothers (filed for bankruptcy after 158 years in business), Merrill Lynch (about to be sold to Bank of America), and AIG (bailed out by the Fed to the tune of $85 billion). Last summer, I had complained about “seismic” daily shifts in the stock market of about 2% per day. Well, I’d better stock up on some Dramamine, because the market has been far more volatile than that recently, and nearly on a daily basis. So, during four of the last five trading days, a diverse cross-section of 500 stocks has moved by at least 4% in either direction. Even more amazingly, just as it started to feel like the entire financial world was crashing down around us, the market staged a huge, surprising rally in response to the announcement of a new government program and somehow managed to finish in positive territory for the week — the S&P closed up a modest 3.38 points, or 0.27%. I’m no stranger to huge, gut-wrenching downturns in the market, and I’ve said before that financial institutions and individual investors are equally complicit in this mess. In fact, I’m not entirely sure if the banks and investors even deserve to be bailed out. Personally, back in 2004, I opened a mortgage that I could actually afford — I suppose that makes me old-fashioned. But perhaps something good will come out of this maelstrom. Remember the shameful accounting scandals at Enron, WorldCom, and Tyco back in 2000–02? Those dark days eventually led to the Sarbanes-Oxley Act and a renewed focus on corporate responsibility. I’d like to think that this subprime mortgage crisis, while frightening at the present moment, will also result in long-term reform and stability, too. Time will tell, but for now, I’m content to stay the course. We all know that talking on one’s cell phone while driving is dangerous. In fact, one recent study showed that such multitasking on the road can triple your chances of being involved in an accident. It’s bad enough that individual drivers are often distracted on the road. But regardless of the outcome of the California accident investigation, how many other train engineers, bus drivers, and cabbies are sending text messages while our lives are in their hands? 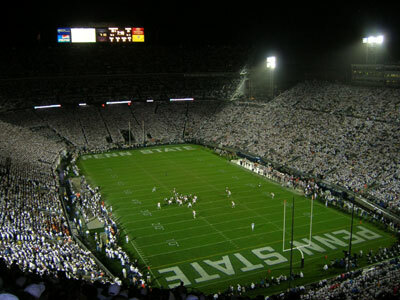 Over the past several years, I’ve joined some friends in embarking on road trips to the campuses of Nebraska (2003), Michigan (2005), and Wisconsin (2006) to see our beloved Nittany Lions play a college football game outside the familiar confines of Beaver Stadium. This year, our collective wanderlust led us — my friends Larry, Tony, John, Brandon, Joe, and me — to organize a fourth outing, this time to Syracuse. Friday. For our previous PSU trips, I’ve driven south to Washington, D.C., to meet up with rest of the gang. But since this year’s destination was located in upstate New York, the other guys hit the road early and picked me up at my house around 9 a.m. in a rented royal blue Dodge Caravan. Also, unlike the past three journeys, during which we shared the driving duties, Larry (our trip organizer, whom we respectfully dubbed The Chairman) took the wheel and completed the entire, rain-soaked drive along I-476 North and I-81 North to Syracuse by mid-afternoon. Upon arriving in town, we headed straight to Dinosaur Bar-B-Que for a late lunch. Larry, Tony, and I couldn’t resist ordering a full rack of ribs, which were among the best I’ve ever had. The six of us checked into a pair of rooms on the 18th floor of the stylish Renaissance Syracuse Hotel, and after the long van ride and huge meal, opted for an extended nap. Later in the evening, we rallied and headed out for a few rounds in a mercifully quiet room at the otherwise hopping Coleman’s Irish Pub. Before heading back to the hotel, we stopped by a local landmark a few blocks away — an upside-down, green-on-top traffic light, which has been a part of Tipperary Hill folklore since the 1920s. As we walked back to the minivan, we noticed a cop writing up tickets for every vehicle parked on the same side of the street as ours, but miraculously, we were spared. In spite of the humid conditions and our dismal track record of three straight losses on previous road trips, the Lions treated us to a dominating (and hardly unexpected) beatdown of the struggling Orange. Penn State jumped out to a 28–0 lead within the first 18 minutes of the game and cruised to a 55–13 victory, their third straight blowout of the young season. The contest actually grew somewhat boring, and the group consensus was to leave the game after three quarters (a rare decision on my part). After the game, we walked through the Syracuse campus and across town to the Syracuse Suds Factory, where we grabbed a large table just before the crowds arrived. While there, we enjoyed a leisurely dinner and watched the majority of top-ranked USC’s humiliating 35–3 rout of then–No. 5 Ohio State. Sunday. We hit the road around 10 a.m., stopped for lunch at a Friendly’s near Scranton, and I made it back to my house by 3 p.m. — much earlier than any previous road trip that I can recall. Make sure to check out the photos from the trip! Quitters never win, but in the world of professional sports, some winners never know when to quit. Lance Armstrong, who won a record seven consecutive Tour de France races after beating cancer, retired from cycling after his final victory in 2005. However, this week, he announced that he plans to come out of retirement to compete in 2009. Armstrong is hardly alone in getting itchy after retiring from a very successful career in sports. For the past few months, ESPN has been practically hijacked by the endless saga of Brett Favre’s decision to return to the NFL — a stunning reversal of his tearful retirement from the Green Bay Packers in March. And who can forget Michael Jordan, who won three straight NBA titles with the Chicago Bulls, retired in 1993, returned to the Bulls in 1995, won three more titles in a row, retired once more in 1999, and came back again to play two final seasons with the Washington Wizards? I can understand why top athletes would want to compete as long as they possibly can; it must be a huge letdown to work in any other field compared to competing in the pros. But inevitably, there comes a time when athletes must accept their limits and call it a day. Here’s hoping that the next sports icon who decides to retire does so gracefully, and only once. However, I’m always disappointed when I see a Facebook status that simply reads, “John Doe is hard at work.” That’s arguably the least creative status ever, and besides, if you had enough time to update your Facebook profile, then you’re probably not really working that hard to begin with. Four years after I first questioned the intrinsic value of the Democratic and Republican National Conventions, the media hype surrounding those quadrennial political spectacles has only become more ridiculous. And having watched the acceptance speeches by both Barack Obama and John McCain, I’ve arrived at a simple, bipartisan conclusion. During Obama’s speech in Denver last week, many Democratic delegates actually cried while chanting, “Yes we can! Yes we can!” And during McCain’s speech earlier tonight, many GOP delegates frantically waved their signs while chanting, “USA! USA!” (as though Democrats live in some other country). There are many more of us who were unable to attend either convention, mostly because we have actual jobs. And we know all too well that presidential candidates sound quite inspiring during their campaigns, but they have a depressingly predictable habit of failing to deliver on most of their promises after they’ve taken office. * Note: For the record, this quote comes to us from American writer Rita Mae Brown, not Albert Einstein or Benjamin Franklin. If you haven’t noticed by now, I tend to choose my words very carefully on this Web site. Every once in a blue moon, a strongly worded rant might raise a few eyebrows, but I’ve always followed an unwritten rule (well, unwritten until now) to keep my language and subject matter relatively clean. I haven’t chosen to eschew profanity and lewd topics on the basis of self-righteousness. In fact, I’ll be the first to admit that I’ve used my share of colorful language over the years, especially while behind the wheel and during particularly ugly football games (e.g., Iowa 6, PSU 4 back in 2004). No, here’s the problem: anyone can view this site — my family, my coworkers, maybe even some old friends who happened to Google my name — and I don’t want to give a bad impression by what I’ve written here. I’m not pretending that thousands of people visit my site daily, hanging on my every word. But still, I’d like to prevent any situation in which my words could come back to haunt me. If you think I sound a bit paranoid, consider the precedent of the blog Dooce, whose author got fired in 2002 because she anonymously criticized her employer online. Now, years later, she admits that she was foolish and naive (“My advice to you is BE YE NOT SO STUPID,” she writes). Ironically, her site has been wildly popular ever since, and she now earns a modest living by blogging, of all things. Access denied to system per [Employer Name] Corporate Security Requirements because of content categorization. Sure, my little corner of the Internet is anything but work-related, unless you’re an aspiring monorail driver. But my friend reports that she can still view plenty of other blogs, so why did my site fail the safe-for-work test?